If you thought bicycle accidents are rare, think again. 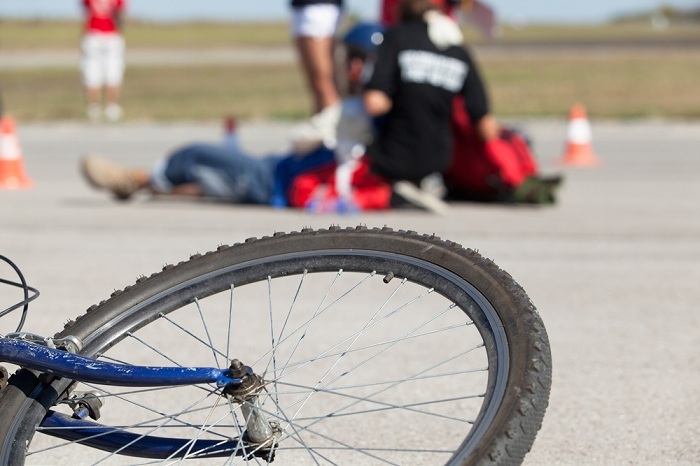 Bicycle accidents are more common than you think. In fact, each year, about 1.2 million people visit the physician as a result of bicycle accidents, and around 950 people pay the ultimate price. Since most bicyclists are required to only wear a protective helmet, their bodies are exposed to the force of the collision. There is nothing to protect bicyclists from getting injured in a direct collision with another vehicle. Here are the most common injuries caused by a bicycle accident. Even with a protective helmet, the bicyclist will most likely endure a head trauma upon impact with either an obstacle or another vehicle. In scenarios where the bicyclist hit a pedestrian, the chances are that the pedestrian will be the one who suffered greater injuries, but the bicyclist may also lose balance and fall off the bicycle, ending in the head or other injuries. However, any injury to the spinal cord could leave the bicyclist forever paralyzed. Depending on the injury, the injured individual may never walk or cycle again. For that reason, it is essential to speak with an experienced Philadelphia bicycle accident attorney and seek their help in obtaining compensation for the injuries. If the injury is grave, medical bills will be too much to handle, and the injured individual may require additional procedures in the future. It can all be taken care of with one simple injury claim. Be sure to reach out to our attorneys if you got injured in a bicycle accident. Another common injury sustained by many bicyclists over the country is related to fractured bones. Almost every impact and collision with an obstacle or another vehicle will result in at least one broken bone. Since both arms and legs are exposed to the collision, the chances are that they will get broken. If the bicyclist ends up in a collision with another vehicle, he or she will use the arms as cover for the face and head. It is a natural instinct of the body to protect the head. At that point, the arms will suffer and absorb most of the damage, and most likely get broken, cut or bruised heavily. Besides head injuries, neck injuries are also quite common for every injured bicyclist. Due to the force of the impact, it is easy for the bicyclist to endure a neck trauma, and end up with serious neck injuries. These injuries may prevent the bicyclist from enjoying life and riding a bicycle ever again. The only proper way to deal with an accident is to speak with Bicycle Accident Attorney in Philadelphia from Dan Doyle Law Group, schedule your initial consultation and learn how you can file a claim against the party responsible for causing the accident in the first place. Be sure to give us a call, and we will help you obtain compensation for your medical bills and your lost wages, as well as all the property damage that you sustain from that accident.